During the 1870's Stannard and Dixon held a monopoly of the printing of music covers and some of the best known music illustrators were employed by them such as Alfred Concanen, who was their 'artist in chief'. This is a beautiful illustration of the Castle at Balmoral, the Home of the Queen. 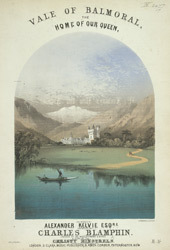 The estate was purchased in 1853 by Prince Albert as a holiday retreat. The house quickly won a special place in the family's, and therefore the nations, affections.